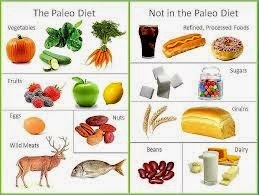 The Paleo Diet is an ancient way of eating that just may be able to improve the quality of your modern life. The theory behind Paleo diet is that our genetic makeup is still very similar to that of our caveman ancestors who lived during the Paleolithic Era more than a million years ago. And that we can benefit by following the diet of those primitive but rugged people. Agriculture, the farming of plant crops for food, has only been practiced for the past 10,000 years. The Paleo belief is that this is not enough time for us, as a species, to properly adapt to the intake and digestion of these food types. That more time is required for the human metabolism and physiology to adjust to foods like wheat and other grains, legumes (beans) and dairy products. And this is one reason why we have so much lactose intolerance, so many people have wheat allergies and complain of indigestion and acid reflux disease. The Paleo diet is basically the diet of the caveman: lean meats and seafood, fresh vegetables and fruit and seeds and nuts. This diet avoids all processed foods, meaning, if it's packaged, don't eat it. The main ingredient to Paleo eating is lean animal protein in the form of beef, pork or seafood. This also includes organ meat like tongue, liver and sweetbreads. Dairy is out since cavemen did not tend to herds of cows, sheep or other animals. Eggs, however, are allowed as the cavemen probably were able to occasionally gather eggs from nests. Nuts and seeds are also permitted and are an important source of €good€ fats, the polyunsaturated and monounsaturated fats. Our bodies require fat in order to function properly and these good fats will not contribute to heart disease and high blood pressure. They do contain calories, however, so if you're trying to lose weight you'll want to watch your intake of nuts and seeds. But by following the Paleo diet, you will increase your metabolism, which will allow you to increase your intake of nuts and seeds without gaining weight. But the sky is the limit pretty much when it comes to fruits and vegetables. You can eat as much of those as you like and any kinds with one exception. Stay away from potatoes. But anything that is green is great. Green leafy vegetables provide high amounts of fiber, they are rich in folic acid, vitamin C, potassium and magnesium, all essential nutrients. And the same for fruit, though again, if you're trying to lose weight you should avoid the high fructose fruits such as grapes and melons and eat more citrus. A good rule of thumb with Paleo is to avoid foods that come in a box or other such packaging. But there are a few other foods you'll want to stay away from that you may not consider to be packaged foods. Those include grains, sugar and dairy products. So no bread, cookies, pasta or alcohol. No sodas, candy or other sweets and no syrup on your pancakes. Wait, no pancakes! And of course, no butter, cheese or milk. This diet may seem very limiting. But there are many testimonials that the benefits gained from following this diet can be liberating, even life changing. The meals are all very high in protein. And it's been shown in dietary research that staying on a high-protein diet for at least 6 months can result in an average weight loss of 10-15 pounds for an average person, without necessarily increasing the amount of exercise you do. So imagine how much weight loss you might see if you follow the diet AND exercise more. Give it try!